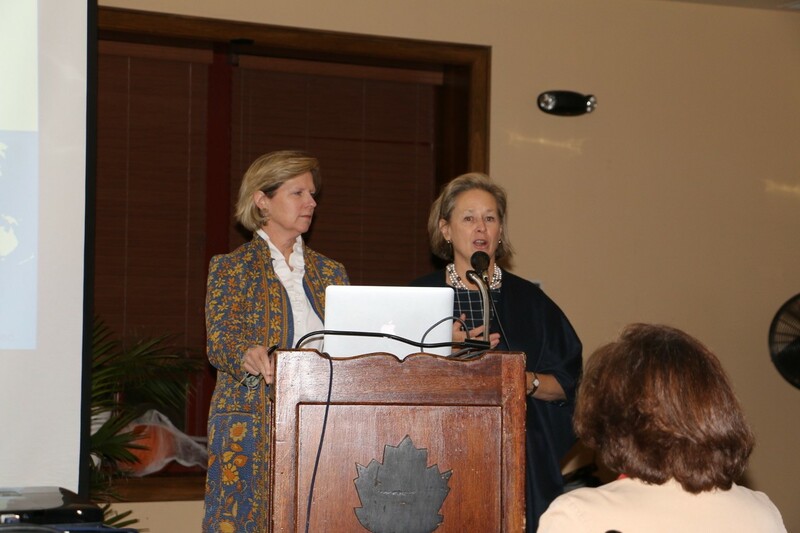 On Wednesday, October 17, 2018, the Land Alliance, in partnership with the North Country Garden Club, hosted an informative, non-partisan and balanced lecture about climate change. We were very fortunate to have Kathleen Biggins one of the founders and President of C-Change Conversations speak to more than 100 community members about the science of climate change. Kathleen Biggins, Katy Kinsolving, Carrie Dyckman and Pam Mount founded the nonprofit C-Change Conversations initially to help engage friends, family and colleagues on the topic of climate change through an informal lecture series. They found that many participants were searching for a more comprehensive overview that addressed the risks and opportunities associated with climate change. As a result, the organization has grown and through educational presentations and conversations with climate experts, they have informed more than 3,300 people nationwide about climate change and how it will affect their lives and futures. 1. How do we know it is real? – scientists measure it every day. 2. How do we know it is us? – climate models show climate change is not caused by natural events. 3. What do scientists think? – 97% or more of Climate Scientists say human-caused climate change is happening. health and personal security, geopolitical stability. 5. Is there hope that we can meet the challenge? Yes, but we all need to do our part! Kathleen addressed each question with supporting facts and graphic illustrations. She showed a time-lapsed film of the critical artic ice melting from 1990 to today and side-by-side image of Alaska’s Muir Glacier, which in 1941 was intact, and today is a fragment of its original size. The images were both difficult to watch and made it very difficult to deny there is, indeed, a change caused by humans. While the answers to questions one through four were eye-opening and startling, Kathleen did answer yes to question five – there is hope that we can meet the challenge. However, we cannot wait for government or corporations to solve the problem. We all need to do our part now. What can we do to start the conversation in our community? Become an educated consumer and follow media outlets such as Climate Central, Scientific American, Financial Times and Bloomberg. Vote and contact your representatives. The voices of many can make a change. Support non-profit organizations whose work helps to addresses climate change like the North Shore Land Alliance. Reduce your own carbon emissions. Be an active shareholder and informed employee. The Land Alliance will be partnering again in 2019 with other community organizations to help bring the C-Change Conversations back for another presentation. In the interim, please visit www.c-changeconversations.org to learn more about how you can help to stop the impact of climate change on our community and beyond.